Russia’s seat on the UN Human Rights Council is under threat due to its support of the Syrian government’s air campaign in Aleppo. More than 80 human rights and aid organisations, including Human Rights Watch, CARE International and Refugees International, have urged UN member states to drop Russia from the Human Rights Council over its military campaign in Syria. In a joint statement published on Monday, the organisations urged UN member states to “question seriously whether Russia’s role in Syria – which includes supporting and undertaking military actions which have routinely targeted civilians and civilian objects – renders it fit to serve on the UN’s premier inter-governmental human rights institution”. “Russia’s gross disregard for civilian lives in Syria and its responsibility for illegal attacks makes it unfit to serve on the council,” Louis Charbonneau of Human Rights Watch told Al Jazeera. Russia has been supporting Syrian President Bashar al-Assad’s war against opposition rebels and the Islamic State of the Iraq and the Levant (ISIL, also known as ISIS) since September 2015. Last week, the United Nations High Commissioner for Human Rights, Zeid Ra’ad al Hussein, said the siege and bombing of eastern Aleppo in Syria constituted “crimes of historic proportions” that have caused heavy civilian casualties amounting to “war crimes”. But the Russian Ambassador to the UN, Vitaly Churkin, accused the NGOs of acting “ideological” and said Russia contributed “very well” to the council. “Often, of course they become too ideological, they talk about things in a politicised way,” Churkin said. On Tuesday, Russia’s Defence Ministry spokesman Major-General Igor Konashenkov said Russian and Syrian planes had not even approached, let alone bombed, the devastated city since last Tuesday, when Russia suspended air strikes ahead of a pause in hostilities. Later on Tuesday, Sergei Rudskoi, a defence ministry official, said that the moratorium on air strikes was being extended but did not specify its duration. However, the Britain-based monitor, Syrian Observatory for Human Rights, said air strikes had resumed since the lull in fighting ended on Saturday, focusing on major front lines, including in the city’s southwest. Meanwhile, elections to fill 14 seats at the 47-nation Human Rights Council will take place at the UN General Assembly on Friday. Russia, Hungary and Croatia will be running for two seats representing the Eastern European group at the council, which is tasked with addressing rights violations worldwide. “Russia is not the only candidate country facing criticism,” Al Jazeera’s diplomatic editor James Bays, reporting fron Geneva, said. And on Tuesday, Amnesty International accused the US-led coalition fighting ISIL in Syria of not taking enough precautions to avoid civilian casualties and underestimating the impact of its operations on civilians. Amnesty International said as many as 300 civilians have been killed in 11 attacks conducted by the US-led coalition since September 2014. 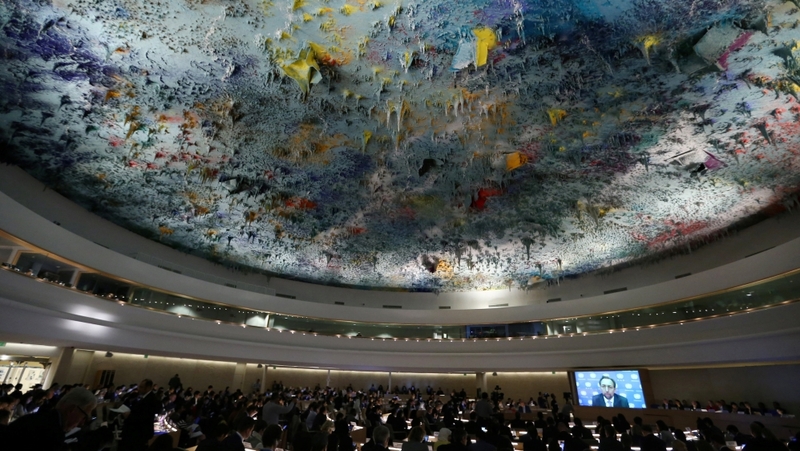 The US’ bid to keep its seat in the UN Human Rights Council is not yet contested. Created in 2006, the UN Human Rights Council monitors violations and in particular set up a ground-breaking commission of inquiry on North Korea that led to calls for war crimes prosecutions of the Pyongyang regime.